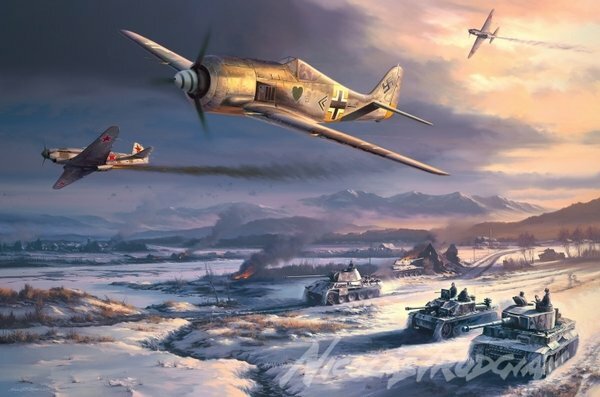 Each limited edition print, except the Canvas Giclee, is accompanied by a companion pencil print 'STORMBIRD OVER BERLIN' portraying Erich Rudorffer, piloting an Me262 jet fighter, as he intercepts a formation of USAAF 'Flying Fortress' bombers over Berlin in the closing weeks of the Second World War. Overall companion print size 15½" x 11½"
Each print is numbered and signed in pencil by Nicolas Trudgian and the signatories and is issued with an original certificate of authenticity from the publisher. Plus matching numbered pencil print 'Stormbird Over Berlin'. Both prints signed by the Artist. Each print has a unique original pencil drawing inscribed on it by the Artist and is signed by the Artist and Major Erich Rudorffer KCOS PLUS matching numbered pencil print ‘Stormbird Over Berlin‘, signed by the Artist. The only opportunity to obtain the full-size canvas reproduction of this painting, individually signed and numbered in paint by the artist. ROLLED Particularly popular for shipping overseas, these canvas giclee prints are supplied rolled and will require stretching onto wooden formers by your picture framer before framing.